Incontinence in your house mate is clearly a big challenge. Incontinence can arise from fear, excitement, natural aging, or after neutering or spaying or having a litter. It is very important to seek a diagnosis from your veterinarian to rule out more serious conditions such as bladder cancer. If the diagnosis is purely age related incontinence Leaks No More can help you and your mate. 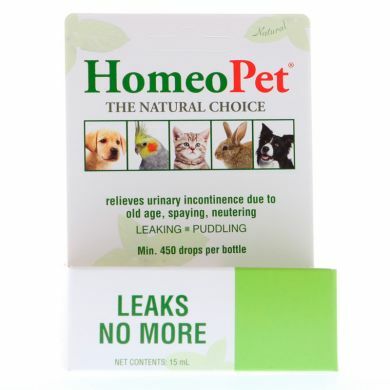 Formulated by vets specifically for incontinence, HomeoPet Leaks No More is an 100% plant based liquid which is easily administered in liquid form. Most solutions to this incontinence involve pharmaceuticals (such as Phenylpropanolamine (PPA)) which can cause unpleasant side effects. Finally we have another option! Oxide Of Aluminum (Alumina 6c & 30c): old age incontinence.